WiPath Communications is NZ's leader in the provision of high quality indoor and outdoor electronic LED signs and displays. 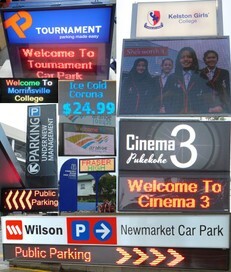 Outdoor LED signs for businesses­, schools, churches, carparks. Indoor LED signs and electronic display systems. Video walls, traffic signs. WiPath specialises in custom LED signs and displays designed and manufactured specially for NZ conditions and to suit your requirements exactly. We don't try and fit your requirements into standard boxes or build signs from inflexible and inappropriate modules as some suppliers do. Moving message and video displays attract up to 10 times greater visibility and notice-ability when compared with static signage. You will find that despite the bespoke nature of most of our solutions our prices are extremely competitive with off the shelf and lower quality systems. All of our enclosures are built from aluminium or stainless steel. Most other signs on the market are made from lower cost powder coated steel which is totally unsuitable for NZs extreme weather conditions. We are the leading supplier of LED signage solutions to schools, car park operators, clubs and retail and commercial users nationwide. Contact us to discuss your signage requirements.